PuttyCM displays multiple PuTTY sessions in Tabs. In this article, let us review in detail about the 6 powerful features of the PuTTY Connection Manager that will make PuTTY more enjoyable. Download PuttyCM: PuttyCM website seems to be down for a while. No problem you can still download from our repository download puttycm.exe that I’ve been using. PuttyCM is written in C#. You need .NET 2.0. When you install PuttyCM for the first time, you need to specify the location of the PuTTY executable. This is the best feature for which i have loved it most .You can open multiple putty sessions in one TAB, just like you open multiple text files in "notepad++" see below figure for more. In order to make it run smoothly you need to set few settings as mentioned below. Go to Tools -> Options -> Select the check-box “Enable additional timing for PuTTY capture (ms)” -> set the value to >=500 ms. This will open the PuTTY window inside the TAB as shown below. Second best feature is apart from displaying multiple PuTTY sessions in Tabs, PuttyCM can also show different PuTTY sessions in panels.This will enables you to view multiple sessions at a time. 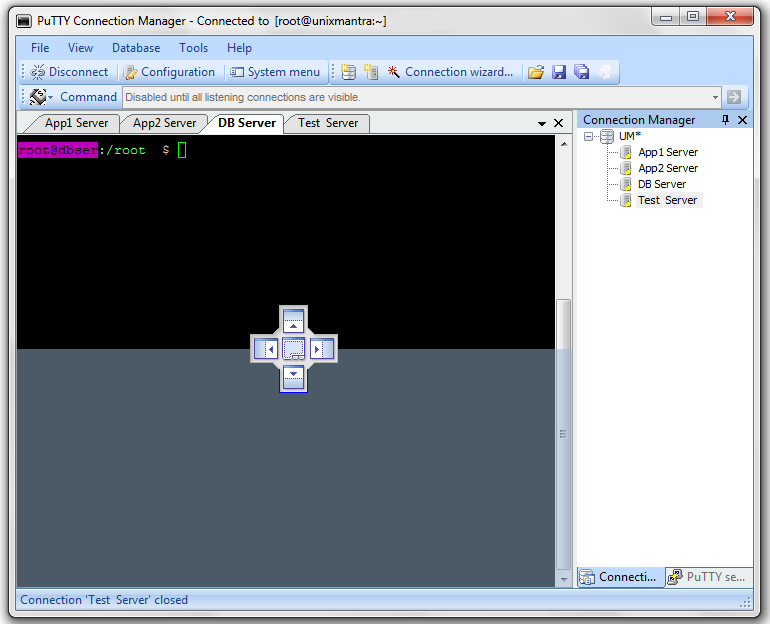 In the example below, to move the "DB Server" PuTTY session to the bottom panel, left-click on the 'DB Server' tab and hold the mouse until it displays the panel symbol (which will be like a Plus symbol) in the middle of the screen. Now move the mouse to the bottom of the plus, which will high-light the bottom portion of the screen indicating that the DB Server session will be moved to the bottom panel. 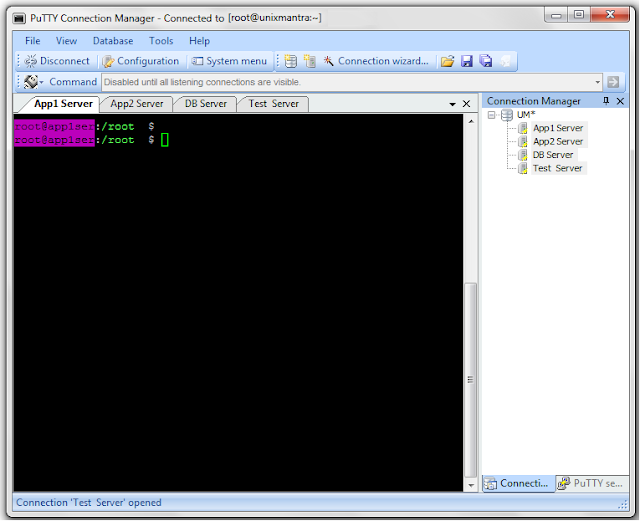 Now, release the mouse, which will move the "DB Server" to the bottom panel as shown below. Using the similar technique you can move all the PuTTY sessions to different panels as shown below. This is yet another beautiful feature but yet more dangerous as well in PuttyCM unless you use it with cautiously. 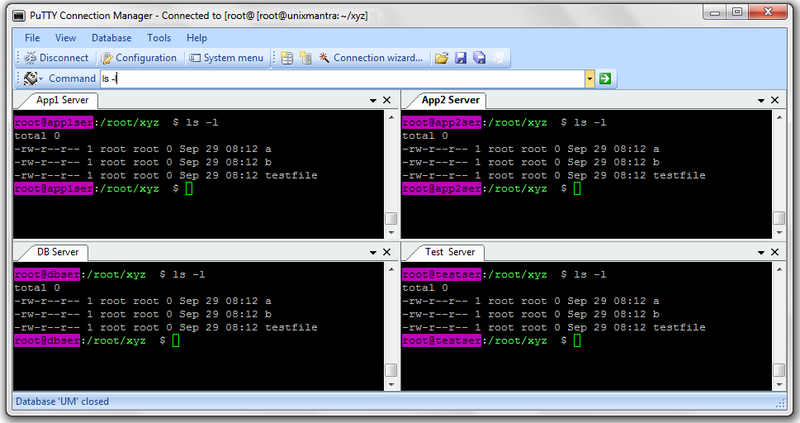 You can run the same command on multiple servers with one shot.This will save a lot of time specially for system administrators. Make sure that you running correct command before hitting enter, otherwise it will become a big mess. In-order to use this feature we need to open dockable windows as specified in feature 2. 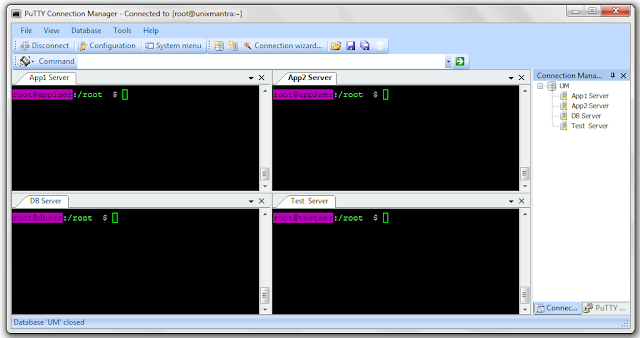 Then you need to select on which servers you want to run single command just like show in the below figure. Fig: PuTTYCM Multi Command Sender server selection. Then you need to run the command which like on the "Command Tab" just like below and you will see its running in all the server windows you selected. Hurrey ..! that's amazing right. Fig: PuTTYCM Multi Command Sender "running command on multiple servers"
Download the AES encryption library (pcmcrypt.dll) from our repository. Go to Tools menu -> Options -> Database -> under the Encryption section, the available algorithms should display “AES Rinjdael Managed” as shown below, indicating that the encryption library is successfully installed. Click on File -> New -> Database and enter the appropriate information as shown below to create a secure PuTTY session database. Follow the best practices to create a strong password while choosing the pass phrase for the secure database. Enter a strong passphrase for the database. Click on ‘Create database’ to create the database as shown below. 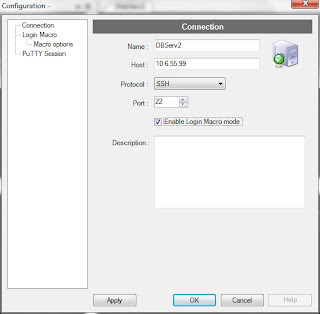 Click on File menu -> save database to save the database to a physical file. Right mouse-click on the ‘putty-secure-sessions’ database name -> Click on New -> Click on Connection, to create a new secure PuTTY session. 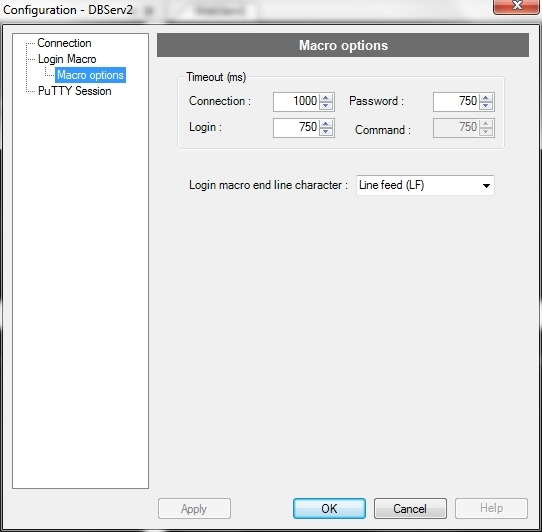 Once you’ve created a secure PuTTY session as mentioned above, you can setup automatic login. 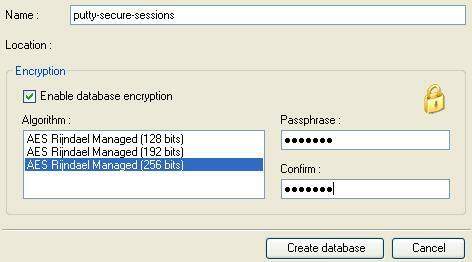 i.e you can save the uid/pwd for the individual PuTTY session in the secure database. i.e When you double-click on a particular secure PuTTY session, it will login automatically. From the putty-secure-sessions database, select a particular PuTTY session, right mouse-click and select Configuration, click on the ‘Enable Macro’ check-box as shown below. 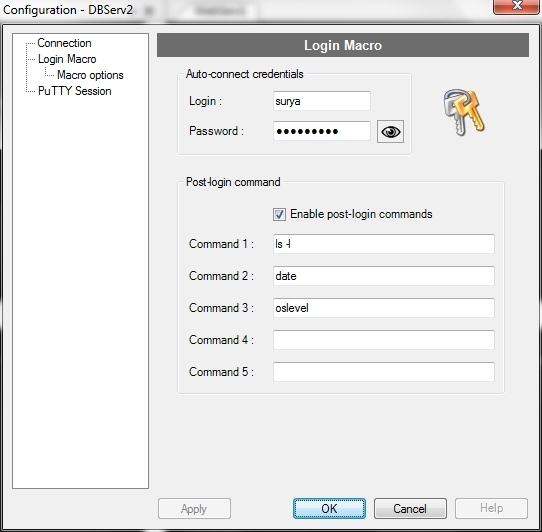 From the same PuTTY session configuration window, click on the ‘Login Macro’ from the left-side menu and enter the uid/pwd as shown below. Now, when you double-click on that particular PuTTY session, it will do the login automatically using the credentials you’ve provided. 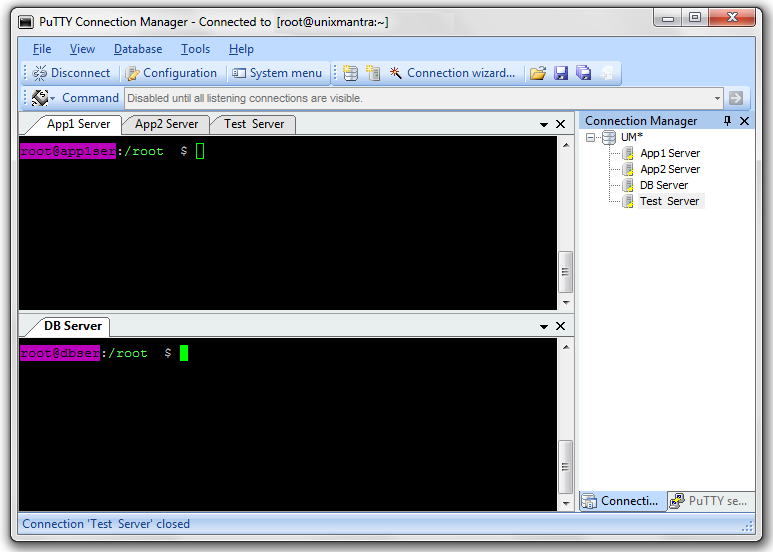 You can also setup post-login command, which will get executed automatically after you login. 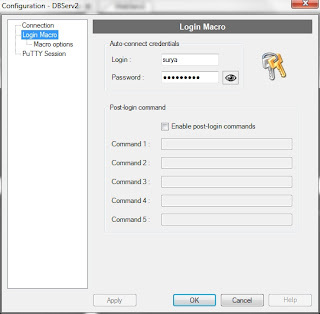 The setup of post-login commands is done under the same ‘Login macro’ screen under the ‘Post-login command’ section. 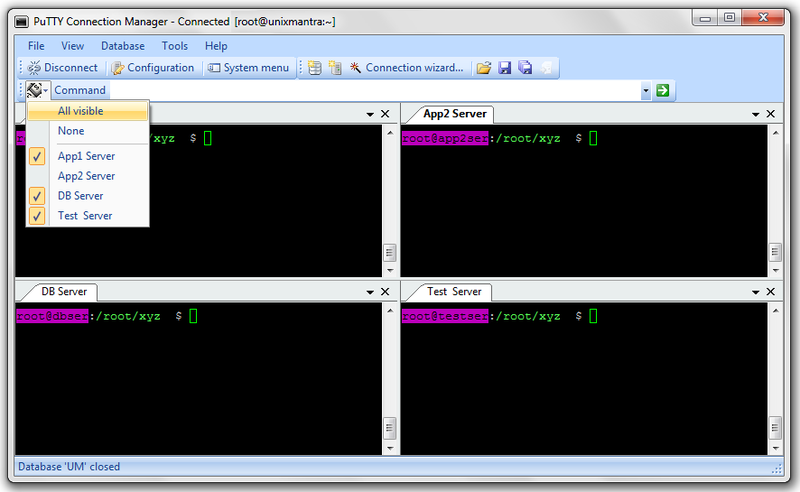 Click on ‘Enable post-login commands’ check-box and you can set a total of 5 post login commands as shown below. 1) When I minimize PuttyCM window it disappears. I can’t reactivate the window using ALT-TAB too. If I try to start the application again it says ‘Application already started’. How to fix this? This can be fixed by changing PuttyCM settings. Go to the menu bar, click on Tools and then Options. Select General from the options in the left side pane. Now in the right side you can see the check button ‘Hide when minimized’. In this case this would have been enabled. Un-selecting this button will solve the problem. 2) Above tip has solved my problem. I am having one more issue now. After I minimize Puttycm windows if I try to reactivate the window by clicking on the Puttycm icon in the taskbar, it does not activate the window sometimes. This is another known problem. You just need to use ALT-TAB to restore the window. Sometimes it does not open immediately even after pressing ALT-TAB once. Try doing it again and it will work. 3) I created a database and created new connections. But I do not see the connections after reopening puttycm, what happened with the old database I created? Looks like you did not save the database. After creating a new database and new connections, you might think that all the changes are saved but they are not. You have do explicitly save the database changes by clicking on File from the menu bar and then selecting Save Database. 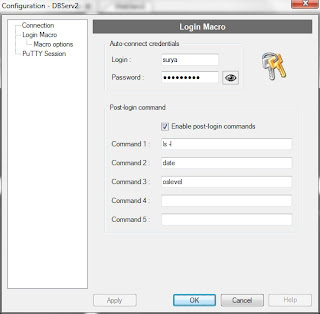 4) How to encrypt the database file? Storing passwords in plain text could be a security issue? There is no in-built feature to encrypt database looks like. There is a check button ‘Enable database encryption’ in Database-> Properties but it’s grayed out. May be the feature is not yet implemented. But you can encrypt the database file using Windows EFS feature if you have a OS edition that supports the feature(XP home does not support EFS). Just right click on the file and Properties -> Advanced. Select the check button ‘Enable encryption to secure data’. 5) Where are PuttyCM’s registry keys stored ? 6) How to disable Ctrl-R binding? Ctrl-R is a shortcut for searching command history in Linux. But doing Ctrl-R in PuttyCM opens up tab rename window. How to fix this? Open Tools -> Options -> Hotkeys. Change the shortcut for rename tab to something else. You would be able to search command history now. Exporting Putty sessions fails with the error ‘Error during export Putty sessions’. Disabling ‘Show tray icon’ has issue. After restarting PuttyCM it shows ‘unexpected error occurred’ message when you try to create a new connection. PuttyCM does not work and you will have to enable ‘show tray icon’ to use PuttyCM. I have not found a way of changing the background color to something other than black. If any of you know solution to this please let me know. How the login takes place in AIX? You need to download and install putty to connect to the server if the server is remotely available. 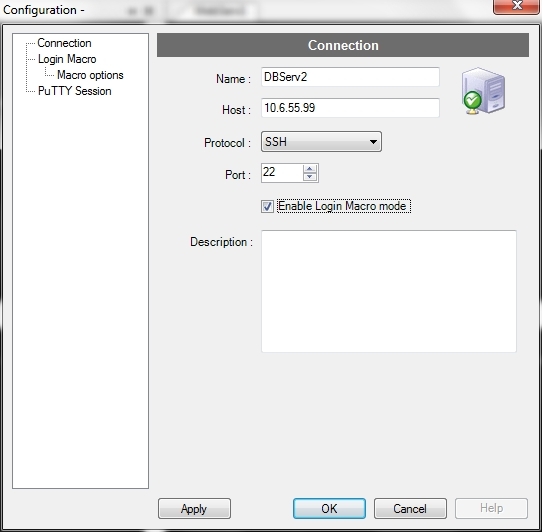 You need to mention the ip address, port number and connection type (telnet, SSH, rlogin etc) and connect to the server. Once connected, the black session screen will appear/open up and will ask for user to login (settings available in /etc/security/login.cfg ). 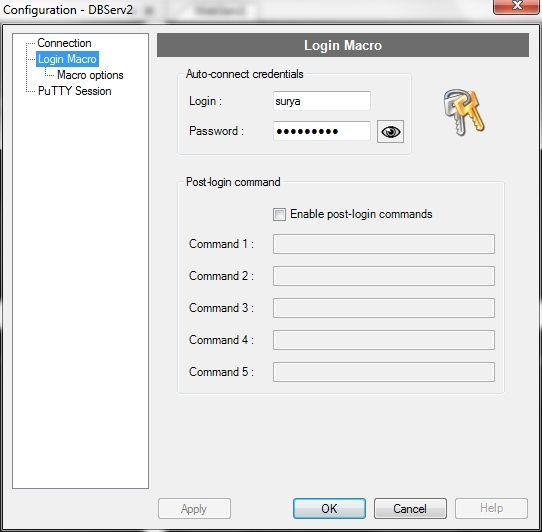 As the user enters the username and password, system verifies the same from /etc/passwd and/etc/security/passwd file. If valid, the user is logged into the system else the user is asked to re-enter the username and password on every invalid entry (records a log entry in /etc/security/failedlogin). Once logged in, the system setup user’s environment. This is available in /etc/environment, /etc/security/environment, /etc/security/user, /etc/security/limits. It sometimes displays the “Message of the Day” configured by the administrator on login. This is available in /etc/motd? File. User’s profile (/etc/profile) will be setup and user will be placed in HOME directory. Now the user can run any commands on the screen. # lpr: for eg: # lpr –p <printername> <filename> : will print the file to a specific printer. Each job sent for print has a print job number associated with it. End user sends a request to print a file using any of the print commands (lp,lpr,qprt,enq) to the print queue. SRC is basically used to control the entire subsystem. It allows you to start, stop and check status information about various subsystem processes. SRC lists all the services present in /etc/inittab. Once the kernel starts all the background services, SRC is activated. SRC is basically designed to minimize human intervention. # refresh will refresh/restart the services. Application need not be restarted for end user. This post will discuss about the concepts involved in network file system (NFS) administration. NFS daemons should be running on both client as well as server machines. A file system should always be available on the server that has to be exported. Exported file system must be mounted on the remote client machine. NFS daemons are not running by default on new OS installation. It will update /etc/exports file. If the file does not exist, it will be created. This command will send the information available in /etc/exports file to the kernel. 1) What is Paging Space? 2) What is Page-in & Page-out? All these questions about paging space will be answered in this very particular post. In a system, there are multiple processes running. For a new process to be actively running, the process should be loaded into the OS memory. Once the process is loaded, it is then assigned number of 4 KB units called page frames. Keeping this in view, more number of additional processes is loaded into the memory with each process assigned 4 KB areas. But when the processes are overloaded and the memory is full, OS scans memory to trace frames that are least recently used. When such a frame is discovered, 4 KB block or page of disk space is allocated and the data from least active frame is moved to area on the disk. This area on disk is called Paging Space. If the paged out information for the least active process is needed back into the memory, the page is retrieved from the disk and brought back into the memory. This is called page-in. Similarly, when the least active frame is moved out from the memory on to the disk, the process is called page-out. If the OS is loaded with many active processes and there is no further real memory available to load additional active processes, the OS goes into the constant state of paging called thrashing as no additional real memory is available to load a new process into the memory. Increasing the amount of paging Space will be of no benefit because the processes involved are all active and thrashing is the result of not enough real memory.